The International Anti-Corruption Conference Council and Transparency International announced today that the 18th edition of the International Anti-Corruption Conference (IACC) will take place in Copenhagen, Denmark on 22-24 October 2018. 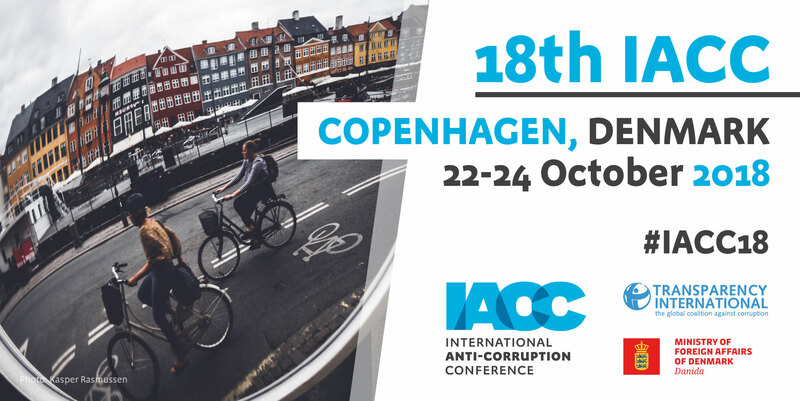 “We are delighted that the 18th IACC will take place in Denmark and are looking forward to stimulating debates and discussing innovative strategies to fight corruption which continues to trap millions of people around the world in poverty and threatens sustainable development,” said José Ugaz, Chair of Transparency International. The International Anti-Corruption Conference, first held in 1983, has evolved into the leading global forum on governance and anti-corruption. It brings together leaders from the public and private sectors, civil society, international organisations, academics and the media to discuss the increasingly sophisticated challenges posed by corruption. The 18th IACC is hosted by the Government of Denmark, represented by the Danish Ministry of Foreign Affairs, and organised with the support of Transparency International Denmark. Transparency International is the secretariat to the IACC Council. Denmark performed best in the past five years on the Corruption Perceptions Index and was one of the first countries to announce a public beneficial ownership registry, which is a vital tool for ending corporate secrecy and preventing grand corruption. Please check our IACC website for the latest information and updates on the conference themes and related events or sign up to our newsletter.